Are you experiencing back pain? Seek help from our chiropractor at Chironow Loveland, and learn more about back pain causes, symptoms and treatments below. We offer walk-in services in Loveland for your convenience. Have you ever offered to do a good deed for a friend or family member, such as helping them move houses? 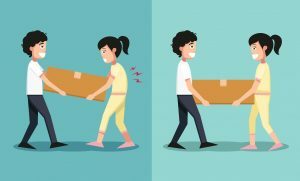 Instead of feeling jovial for completing the task, you may instead find yourself in sheer agony over your back hurting. A staggering 8 out of 10 people in their lifetime will experience low back pain. Back pain can be mild to absolutely debilitating, depending on the root cause. Pain can be a dull ache, muscle spasms, radiating with numbness, tingling or something completely different. However, 9 out of 10 patients don’t know the root cause of how they acquired lower back pain(LBP). 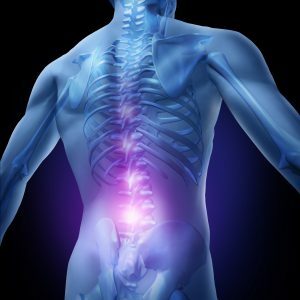 A common cause of lower back pain is mechanical and soft tissue injuries that can include compression of nerve roots, improper movement of the spinal joints and damage to intervertebral joints. The single, most common cause of lower back pain is a torn or pulled muscle or ligament in the lumbar region of the spine. Lower back pain can have causes that are not related to diseases. Some examples include sitting for a prolonged period, sleeping in an uncomfortable position for an extended period of time, overuse from exercise or heavy lifting, or wearing a poorly fitting backpack. Not implementing proper body mechanics while bending down by bending at the knees can also increase your risk of lower back pain. About 50 percent of pregnant women complain of lower back pain due to their center of gravity shifting and ligaments loosening to accommodate their child. Before spending a fortune on primary physician bills, taking medications, or thinking about surgery, try a more natural approach to treating lower back pain. At Chironow Loveland, we believe in helping the body help itself. Chiropractic adjustments help to realign the spine, taking pressure off of spinal joints, muscles and nerves. With better blood flow comes better tissue healing. With proper spine alignment, the brain is able to communicate with the body to heal what has been injured. Getting regular adjustments helps decrease pain, muscle spasms, and inflammation that is associated with LBP, all while improving the overall immune system function. Other natural, non-invasive treatments for LBP are yoga, Pilates for core strengthening, using ice and heat to decrease inflammation and improve blood flow, limiting bed rest, and implementing massage therapy. If you have any questions on how to get started on the path to less low back pain, stop by Chironow Loveland today, we will be glad to help. We offer affordable packages of many sizes and prices to address your acute or chronic issues.